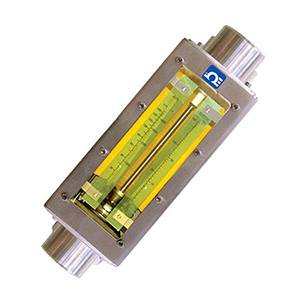 The FLD100 Heavy-duty flowmeters are fully enclosed in a brushed stainless steel case. Ideal for industrial applications with flow rates up to 116 GPM and 250 SCFM. Used with industrial water and air service. Meters are graduated for direct reading of water and air. Flow meters come with FNPT end fittings for easy in-line installation. NIST calibration is not available. For oxygen cleaning add suffix "-O2CLEAN" to model number, add $125 to price. For optional ANSI 150 flange, add suffix "-FL" to the model number. For FLD101 through FLD106 add $84 to price. For FLD107 through FLD114 and FLD116 add $190 to the price. For FLD115 and FLD117 through FLD122 add $345 to the price.